We have a strict rule here at Green Event Ninjas that there’s no talk of Christmas until December. 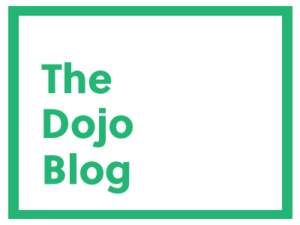 Now that it’s upon us, however, I thought it would be nice to share some simple green event ideas for your Christmas party – whether at home or at work. To put things into perspective, the emitted CO2 over the entire life cycle are approximately 3.1 kg (6.8 lbs) CO2 per year for the natural tree and 8.1 kg (17.8 lbs) CO2 per year for the artificial tree (48.3 kg [106.4 lbs] for its entire life span [of 6 years]). While the two types of trees each have their positive and negative attributes beyond the carbon footprint comparison (e.g. ecosystem quality, resources, human health), we feeling that the climate change impact is most compelling. If you’re one of those that swears by the convenience and tidiness of an artificial Christmas, then worry not! 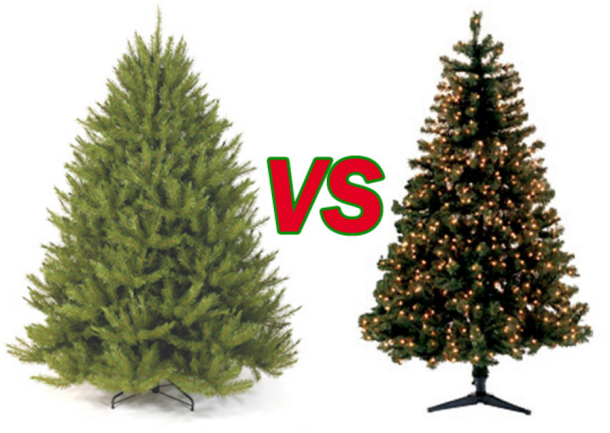 The same study also concluded that if an artificial Christmas tree was used for 20 years or more, its carbon footprint would beat that of choosing a natural tree each year. Furthermore, the study takes into account how far people will travel to pick up their natural trees (5.0 km [3.1 miles], based on their estimated average). So longer one has to travel the shorter that timeframe becomes. Therefore, if your trip to go get a tree would be further than 50 km (3.1 miles), then an artificial may be a better choice in the long-run in terms of climate change. As tempting as it may be to pick up those reindeer themed napkins during your dollar store shopping spree, please refrain. All the chlorine-based bleach, dyes and ink that are used to make the colours so vibrant on those cheap dollar store napkins have the consequence of making them impossible to compost (and probably not very healthy for rubbing against your face either). That’s not to say you cannot find some colourful and festive eco-friendly alternatives. After a quick search online, we found some napkins on Amazon that fit the bill. They’re printed with non-toxic, water-soluble dyes, making them a much better candidate for composting. And who isn’t a sucker for reindeers in ugly sweaters! 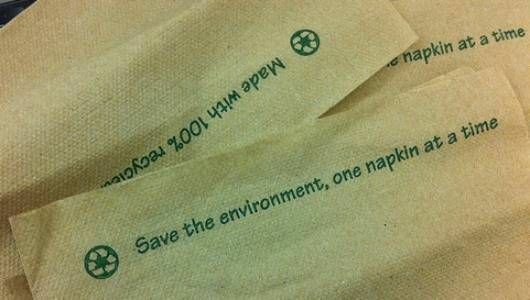 Short of that, stick with natural or kraft coloured napkins, or those that have been whitened with an environmentally safe process without chlorine bleach. Speaking of composting, we encourage you to recycle and compost as much waste as you can from your event. This is often overlooked in the lead up to an event when you’re simply too busy getting everything ready but a few simple steps can make all the difference. If you’re using disposable plastic cups (made with recycled content) to serve drinks, we encourage you to put out a small bin for guests to put their empty cups in. It’s a small win for recycling. Beyond that, recycling can be a bit tricky when food is being served. A paper plate for instance, while recyclable on its own, is no longer recyclable once it’s contaminated with food waste. A lot of people do not understand this and will put a food covered plate in the recycling bin, unwittingly contaminating all the other recycling in there. One way around this leads to our next green event idea. If you’re not using reusable tableware but you’d still like to divert most of your waste, may we suggest using compostable plates, cups, and cutlery instead? This eliminates the dilemma explained above, making it a no brainer for guests on where to put their waste. One piece of advice if you’re going this route is to avoid other sources of contamination too (e.g. plastics that could get in with the organics waste). Plastic straws are an obvious culprit, so try these biodegradable paper straws instead. Chances are some of your guests are going to be partaking in the holiday tradition of “a few wobbly pops too many,” so encouraging your guests to share rides and making sure a select few are designated drivers is all about being a responsible host. The flip side is that it’s great for the environment too! 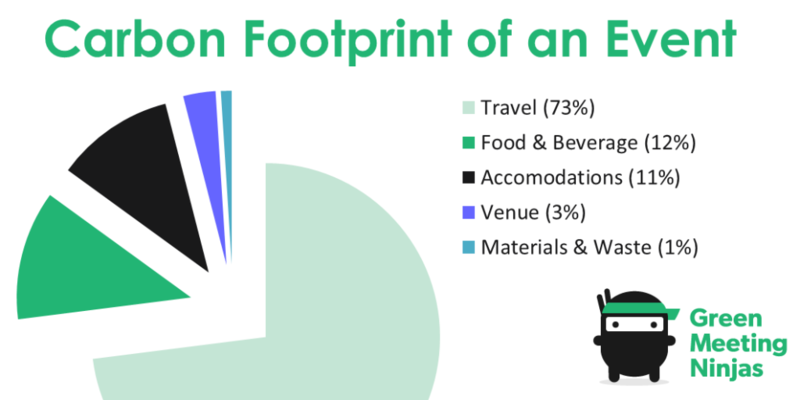 Since transportation can make up such a large proportion of an event’s carbon footprint, reducing the number of vehicles making the trip to your party can have a great overall impact.